LayerMonkey is a versatile script for After Effects that arranges and animates your comp's layers in time and space. It also creates a parented camera and generates a master control layer that makes timing and global adjustments a piece of cake. Now stills, videos and pre-comps can be used as kinetic elements in a complex monkey-generated composition with a simple push of a button. Creates randomized complex kinetic layouts using layers in your comp based on parameters entered into the control panel. Features 3 different algorithms with a Justify option. 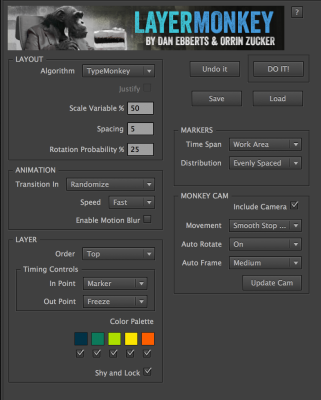 Works with stills, video, pre-comps, shapes, solids, text, eps and pretty much any other type of layer AE accepts. 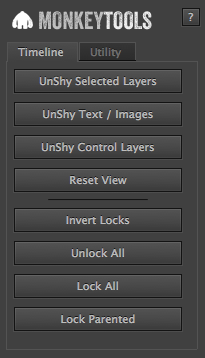 Multiple controls for handling time-based layers. Creates a parented camera that points to each successive layer as it transitions on. Distributes markers across the timeline in 3 different ways. Exludes non- image based layers in comp such as nulls, cameras, audio and adjustments. Palette controls makes colorizing layers very easy. Supports motion blur, lock & shy, and preset Load and Save.